SUMMARY: BK virus infection is most often associated with urologic disease in patients who have undergone renal or bone marrow transplantation. 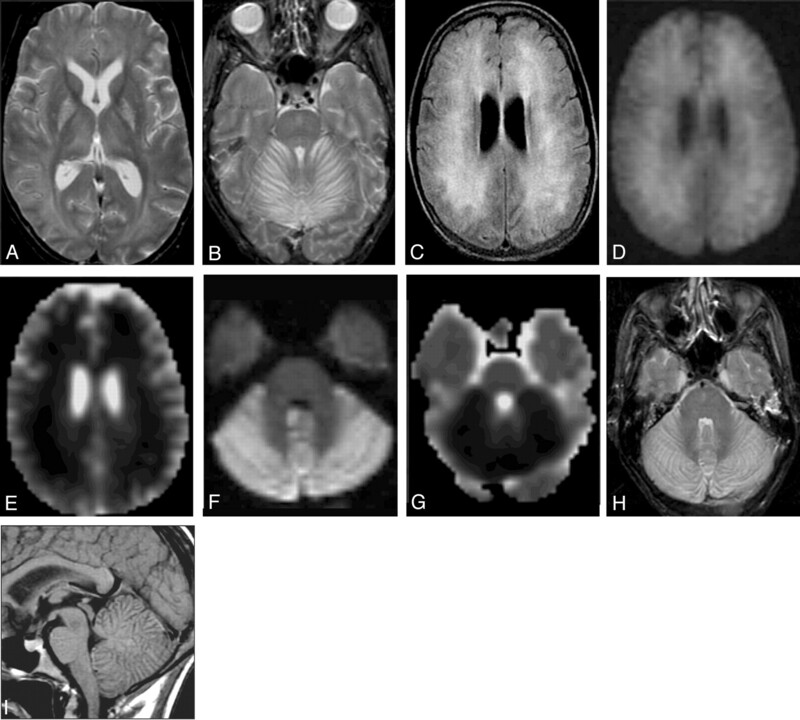 We report a rare case of biopsy-confirmed BK virus encephalitis in an immunocompromised patient with hemorrhagic cystitis, in whom dramatic imaging findings were present despite relatively mild clinical symptoms. MR imaging demonstrated widespread increased signal intensity on T2- and fluid-attenuated inversion recovery–weighted images, with restricted diffusion, in the cerebellum, cerebral white matter, and deep gray matter structures. The simultaneous presence of urologic abnormalities and neurologic deficits in certain immunocompromised patients should prompt consideration of BK virus encephalitis. During treatment of hemorrhagic cystitis secondary to BK virus in December 2003, a 38-year-old woman developed progressive mental status changes and lethargy. Neurologic examination revealed generalized psychomotor slowing and dysarthria, but the examination was otherwise nonfocal. In 1989, the patient had been treated for nodular sclerosing Hodgkin lymphoma; in 2002, she suffered a relapse that was treated with radiation, chemotherapy, and ultimately a stem cell and bone marrow transplant in February 2003. Although her lymphoma was in remission, she developed multiple urologic problems, including intractable hemorrhagic cystitis. MR imaging of the brain was performed to evaluate her current neurologic decline. The examination demonstrated widespread increased signal intensity on T2 and fluid-attenuated inversion recovery (FLAIR)–weighted images, along with restricted diffusion, in the cerebellum and cerebral hemispheric white matter (Fig 1A–H). Similar abnormalities were present in the globus pallidi bilaterally and, to a lesser extent, the thalami (Fig 1A). The deep cerebellar white matter and cerebral cortex appeared to be spared. The cerebellum was diffusely swollen (Fig 1I). There was no abnormal enhancement or hemorrhage. On the basis of the imaging findings, the differential diagnosis included hypoxic-ischemic injury, encephalitis, or a toxic, metabolic, or drug-related process. Further medical and laboratory evaluation did not yield a diagnosis, and a brain biopsy was performed. The biopsy showed nonspecific reactive astrocytosis and rare perivascular lymphocytes; no viral inclusions were identified. Tissue polymerase chain reaction for BK virus revealed 8 viral DNA copies/1000 cells; this was felt to be most compatible with BK virus encephalitis. The patient continued to receive antiviral agents (gancyclovir, valcyclovir, acyclovir) for treatment of her BK viremia and encephalitis and also had adjustment of her immunosuppression. Her neurologic status improved, though she died 5 months later of multiple other medical problems. A 38-year-old woman with hemorrhagic cystitis, generalized psychomotor slowing, and dysarthria 10 months after bone marrow transplantation for relapsing Hodgkin lymphoma. A, Axial T2-weighted MR image shows symmetric hyperintensity in the globus pallidi, as well as the thalami and white matter. B, More caudal axial T2-weighted MR image shows extensive hyperintensity in the cerebellum. C, More rostral axial FLAIR-weighted MR image shows diffuse hyperintensity in the white matter; the cortex appears largely or completely spared. D, Axial diffusion-weighted (b = 1000) MR image at a similar level to panel C shows mild to moderately restricted diffusion in the supratentorial white matter. E, ADC map at the same level as panel D confirms the presence of restricted diffusion in the supratentorial white matter. F, More caudal axial diffusion-weighted (b = 1000) MR image shows moderately restricted diffusion in the cerebellum; the deep cerebellar white matter appears relatively spared. Diffusion restriction was also identified in the globus pallidi (not shown). G, ADC map at the same level as panel F confirms the presence of restricted diffusion in the cerebellum. H, Axial T2-weighted MR image at a similar level as panel F shows extensive hyperintensity in the cerebellum. I, Sagittal T1-weighted enhanced MR image shows generalized swelling and hypointensity of the cerebellum. The deep cerebellar white matter appears relatively spared. There is no abnormal enhancement of the visualized parenchyma. In states of relative or absolute immunodeficiency, the BK virus can reactivate and cause disease. BK viremia can be seen in patients with a variety of immunodeficiencies but appears most frequently in renal and bone marrow transplant patients.1,3,5,9–11 Clinically significant infections with BK virus have also been described in patients with acquired immunodeficiency syndrome.6,8,12 In rare cases BK virus can cause significant disease in immunocompetent hosts.7 BK virus has been associated with such diverse entities as hemorrhagic cystitis, ureteric stenosis, tubulointerstitial nephritis, vasculopathy, pneumonitis, encephalitis, retinitis, and even multiorgan failure.1–12 In particular, whenever an episode of renal dysfunction occurs in a patient with a renal transplant, BK virus should be ruled out as the cause. To the best of our knowledge, there have been only a few reported cases of BK virus encephalitis5,8; the diagnosis has usually been established by testing of CSF with the polymerase chain reaction. In our case, the diagnosis was established by using a polymerase chain reaction assay of tissue. In one reported case, MR imaging showed diffuse, reversible white matter changes, most prominent on long-TR images.7 In our patient, an extensive white matter abnormality was identified in the supratentorial brain; it was interesting that the deep white matter of the cerebellum was largely spared. Deep gray matter structures were also involved. Restricted diffusion, which can be present in the setting of encephalitis, was identified in the affected areas of the parenchyma. Although the cerebellum was diffusely swollen, swelling was not demonstrated in the supratentorial brain. The cause for the distribution and appearance of these lesions is not known. Also interesting, despite the extensive imaging abnormalities, the patient demonstrated only modest, nonfocal, cognitive neurologic deficits. Encephalitis refers to parenchymal inflammation caused by a variety of pathogens, most commonly viruses. Some agents have a predilection for particular areas of the brain; for example, herpes simplex type I favors the limbic system, cytomegalovirus favors the periventricular white matter, and Listeria monocytogenes favor the brain stem and cerebellum. Other agents may affect multifocal areas of cortex. MR imaging usually shows abnormal hypertensity on T2- and FLAIR-weighted images in the gray matter, white matter, and/or deep gray nuclei; diffusion restriction is commonly seen.13 In this context, the clinical and MR imaging findings in this patient, though not characteristic of a particular infectious agent, are certainly compatible with the diagnosis of encephalitis. BK virus is a ubiquitous infectious agent that can be isolated from most adults. Although rare, BK virus can cause diffuse encephalitis, and this diagnosis should be considered in certain immunocompromised patients, particularly those with coexistent urologic disease and neurologic decline. Accepted after revision April 27, 2005.